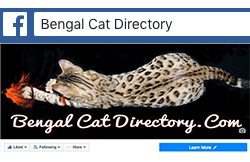 Welcome to The Bengal Cat Directory! The Bengal Cat Directory was created to help you find Bengal Cat breeders in your area, or if you are looking for something very specific, find which breeders may have what you are looking for (such as a retired Bengal, an early generation Bengal, or one of a non-standard color, etc). This site is also meant to be educational – to provide information on Bengals, answer questions and provide resources. 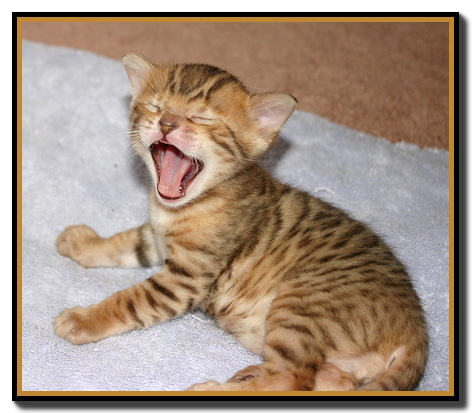 If you are new to the Bengal Cat breed, please read About Bengal Cats first. If you are familiar with Bengals and are ready to start your search, please see the Before you Buy before you start. – You can use the “Search Topic” text field to search for the name of a specific breeder or cattery, or a particular category of pattern or color Bengal. – The “Region” search field is based on google maps, you can search for breeders in your area by zipcode (USA), city, state or country. NOTE: This search is based on distance from one geographic point. Searching for just a state may not find all listings in the state (for example Florida or California) since the default search is within 300 miles. Searching with zip code is best, and you can adjust the distance on the search results page. – You can also find breeders by area listing under the “Find Breeders” button in the menu bar and , or you can search by “specialty” category from there also. Breeders in all countries worldwide welcome!